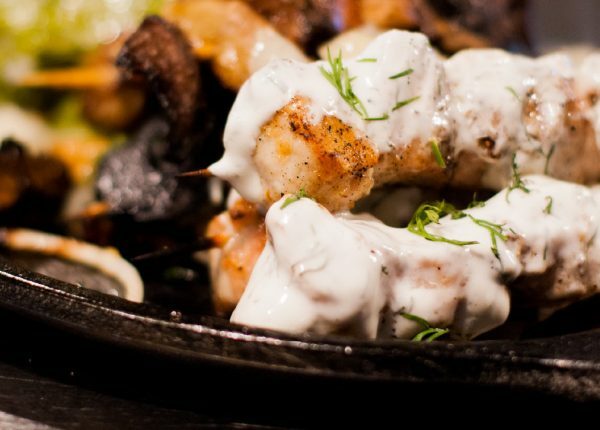 A long-acclaimed Seattle staple, Lola is a laid back Pacific Northwestern fusion restaurant with interesting Greek and North African elements that ensure its prominent visibility on the dining scene. 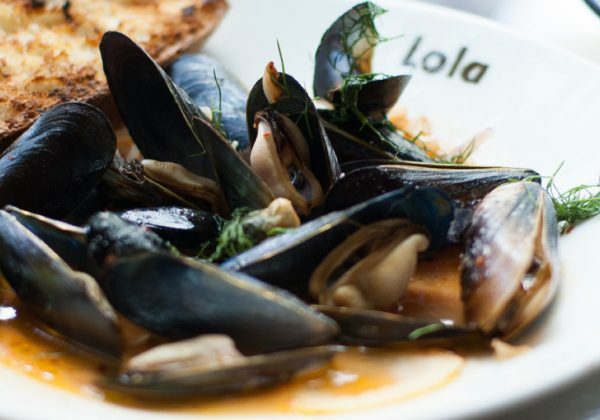 Started by renowned chef and author Tom Douglas, who owns the cooking school in the hotel that houses this same restaurant next door, Lola is one of his original outposts and continues to reign over the Seattle dining scene as a must-visit. 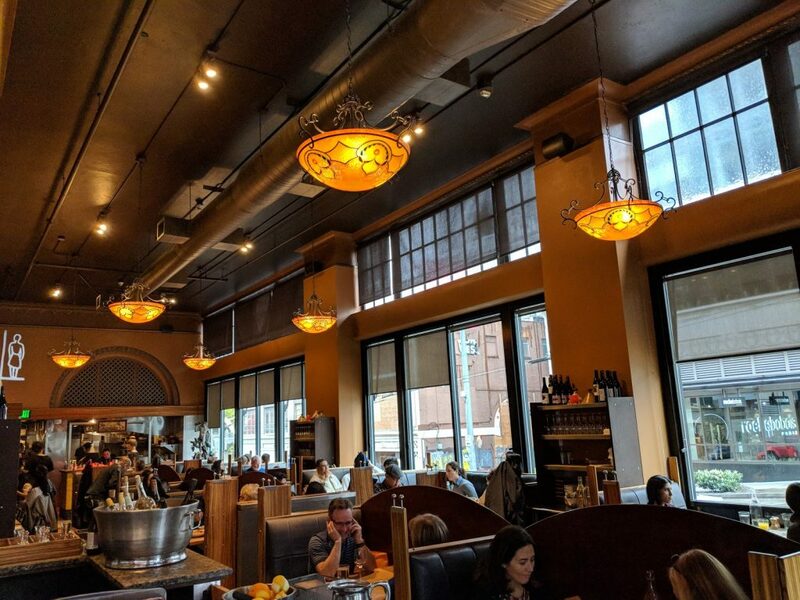 The cuisine focuses on the Greek dining experience with hints of North African tagine-goodness, but uses Pacific Northwestern ingredients (like Bristol Bay sockeye salmon and Penn Cove shellfish) giving it an interesting mix one would be pressed to find elsewhere in this city. The head chef, Tori Mann, a Seattle native born and bred in West Seattle, trained in a local culinary school before progressing to work alongside some of Seattle’s most esteemed chef’s – including Thierry Rautureau at Rover’s and Philippe Thomelin at Olivar. Passionate about the locale’s delicious ingredients and buzzing dining scene, Tori prides herself on staying abreast of all the new developments and keeping Lola current. 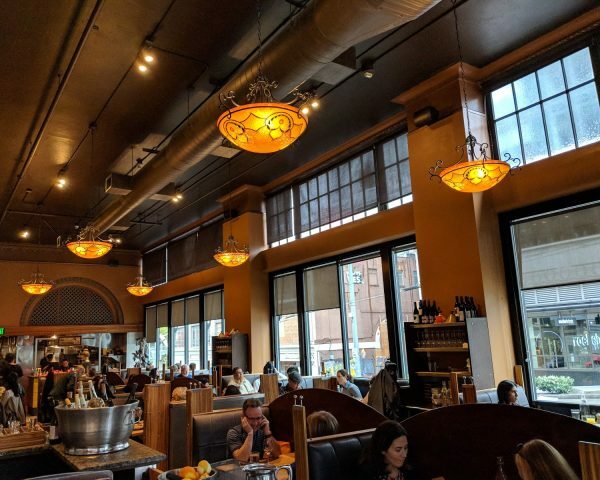 This explains the interesting cuisine: think, mezze with Saganaki, stuffed vine leaves, and Fasolata soup, before Washington chicken kebab and local Seattle Shellfish kakavia to finish. 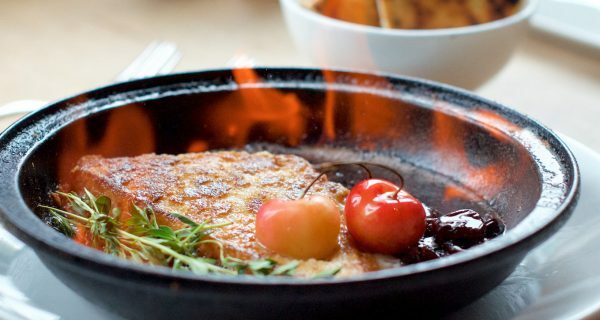 The restaurant itself, next to Hotel Andra, is situated perfectly in the heart of bustling downtown Seattle in its hip Belltown area. Less than a 5 minute stroll from Pike Place Market where one could do worse than have a pre-dinner aperitif whilst watching the sunset over the ocean, Lola is at once convenient and easy. 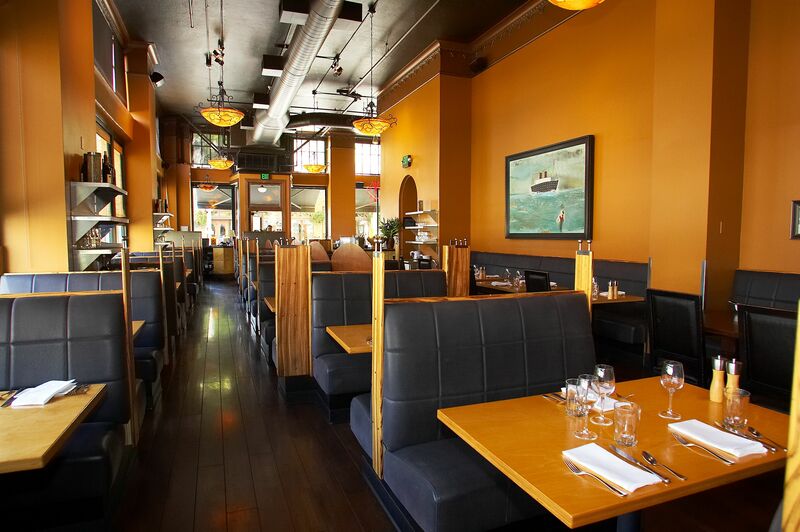 This fits with its vibe: despite being a high-end restaurant of a notable restaurateur, Lola’s is chilled. With a vast, rounded bar upon entry below glowing red “flame” lights, its long and narrow interior of dark semi-private booth seats, warm terracotta walls and exposed ceiling, the restaurant is both contemporary and chic whilst distinctly “familia” in its vibe. Greek fusion cuisine seems particularly apt. Open all day, and featuring an excellent daily Happy Hour from 4pm-6pm (Greek lager, Garlic oregano fries, falafel and squid kebabs feature, amongst others), Lola caters to breakfasts, brunches, lunches and dinners. Whilst breakfast looked busy and delicious, we opted for dinner at Lola’s, strategically timed as an early meal before an evening of bar-hopping Seattle’s Capitol Hill area. Cocktails, mezze, filling mains and, of course, lots of wine, were mandatory for us with this goal in mind, and Lola did not disappoint. The dinner menu features everything from an array of (what we would learn to be unbelievable) spreads, various cold and hot mezze, a ‘Birds, Meat & Fish’ selection, ‘Vegetables and Pasta’, and finally, a somewhat alarmingly huge ‘Tom’s Big Dinner’ option. Delivering everything from the spreads, Washington chicken kebab, squid kebab, greek salad, leg of lamb, Horta potatoes, and doughnuts, this seemed slightly excessive for just the two of us – though at $60 per head, quite the no-brainer for a larger crowd. We began our meal with a cocktail each. My guest had the Apricot Shimmy, consisting of gin, apricot liqueur, lemon, lillet blanc and scrappy’s cardamom bitters. Apparently delicious given the speed within which it was consumed, the Shimmy seemed on par with my option of the Paper Plane – a bourbon, aperol, lemon, amaro concoction served up. An excellent, albeit strong, choice. I did not complain. To start out meal, our engaging host recommended trying the Mezze selection. Given my guest’s preference for vegan food, this was a perfect choice since most of the Mezze delightfully fit that criteria. 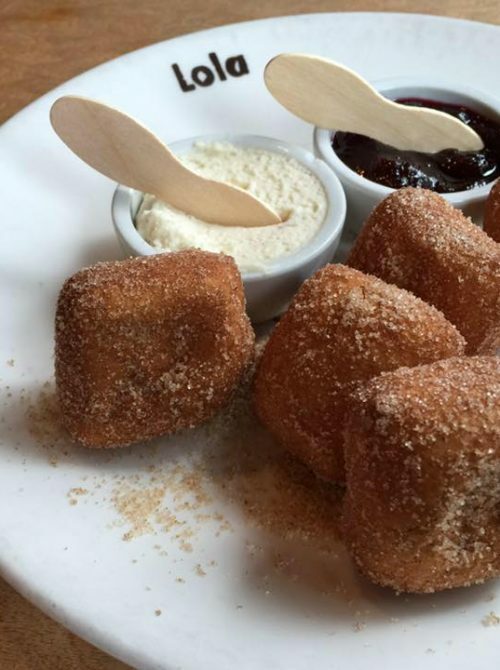 We had the Lola Spreads, a delicious and satisfying teaser for the taste buds. Bursting with layers of tastes that were nutty, spicy, sweet and salty, grilled and garlicky, this was an excellent accompaniment to our cocktails. The tzatziki cucumber yogurt, refreshing with a hint of herbs, was perfect for cooling and neutralising your palate between the kopanisti – Pistachio mavrodaphne, roasted sweet red pepper, kalamata- turkish fig, cauliflower-anchovy, and fava skordalia-garlic spread of this magnificently delicious and perfectly harmonious spread . The fresh Pita bread accompanied by this dish is divine even on its own. Herbed and oiled to perfection, it was the best tasting warm and chewy “chip to this dip”. For the main, our host suggested the famous Lola Greek salad called “Jackie’s greek salad” with barrel aged feta. 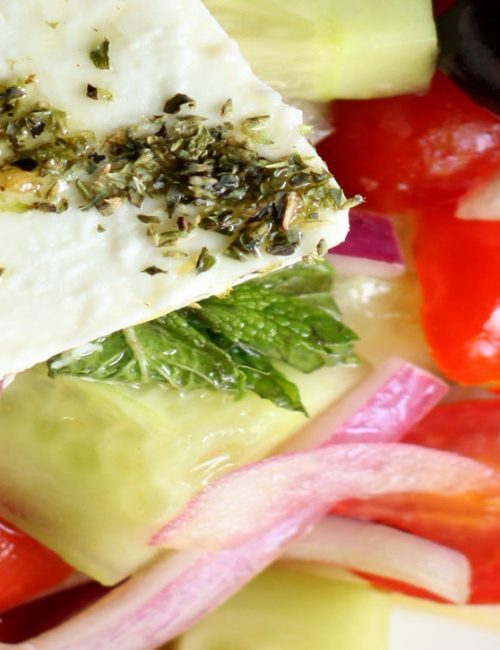 The ingredients of this salad were delicately cut in a way that made the texture distinctive from that of a “classic” greek salad, delightfully gentle on the palate, rather than large chunks, the finely sliced cucumbers, tomatoes, and thin layers of onion were dazzled in olive oil and delicious feta cheese. I had the grilled Spanish octopus of amarosa potatoes, celery, lemon and aleppo. This came as a tower of chargrilled octopus on a bed of potatoes that was both soft and sumptuous whilst crispy in all the right ways. To pair, we had a glass each of the Board Track Racer 2016, the Vincent. A Chardonnay from Columbia Valley in Washington, just down the road from Seattle. With fresh notes of lemon zest and apple, this full bodied, creamy white wine had interesting notes of roasted corn on its finish, rendering it an aptly American wine for this fusion meal. My guest had the Curried chickpeas and cherry tomatoes coconut-cashew dukkah. This creamy and spiced stew like dish had a delicately spiced yet rich taste, the starchy chickpeas were in perfect harmony with the sauce of this dish. The sweet and savoury spanakorizo jasmine rice was a rice dish jewelled with delicious pistachios, greens, and feta is the best possible side to the chickpea stew. I had the shellfish kakavia, a soup like bowl of Penn cove mussels, manila clams, bacon, tomato, sweet corn broth, served with grilled bread. Akin to French steamed mussels but with a meatier, more flavoursome Pacific Northwestern punch to them, this was a delicious and more-ish bowl that required a refill of bread to mop up the chowder-like sweet corn soup. Excellent with the wine, too. It is worth noting the portion sizes at this point: I would have chosen a Braised Lamb or Slow cooked beef oxtail tagine, were I not already so full from the mezze and fresh bread. 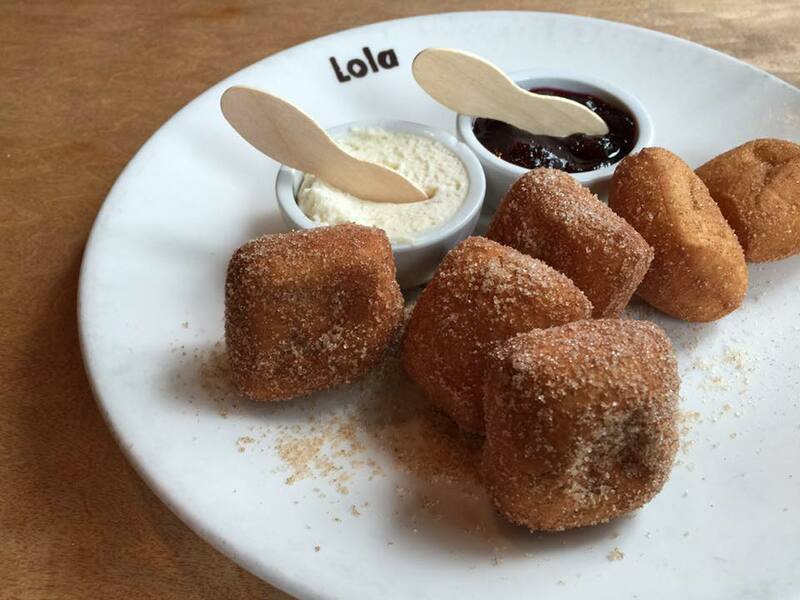 Be warned, Lola’s small servings are bizarrely filling. A good sign, no doubt, of quality ingredients and real food. For the dessert, we made the somewhat erroneous mistake of ordering the Pecan baklava with spicy cinnamon syrup and salted caramel ice cream, and the Triple coconut cream pie white chocolate topped with toasted coconut. Not because they were bad: but because they were so orgasmically good, with portions so large, that I found myself polishing off the entire pie whilst my guest clutched her stomach unable to eat more, having gorged on the baklava. The baklava was crispy on the outside sweet and juicy on the inside, this baklava is a heavenly mix of almond and pistachio flavoured nuts, honey syrups within the thin layered shells of crunch. Meanwhile the coconut cream was a whipped cream light-as-air-Eaton-mess-style-haven of coconut goodness, the toasted coconut flakes adding an exhilarating crunch to every melt-in-your-mouth sensation. I was in a trance in eating this. By the end of the meal, my guest wanted to take a nap and I was achingly aware that I needed to dance off the indulgence. Two espressos later, we left Lola’s giddy with delight (and probably on a sugar high), filled with Greek theatrics, ready for the night ahead. An excellent meal for Seattle, and one we recommend you try for yourself. Thank you Lola!